I adore homemade English rice pudding with lots of ground nutmeg and a brown skin on top, but I hate rice pudding in a tin/can I can never touch that stuff. 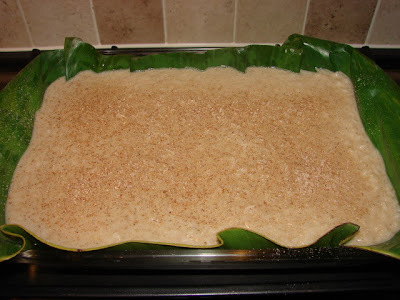 Biko is Filipino rice pudding using glutinous rice and coconut milk. Great stuff. I made this with my own tweaks adding nutmeg like how I love English rice pudding. Also I added a layer of lovely caramel on top. I love Biko as much as the English rice pudding. * If you don't like nutmeg you can use ground anise or ground ginger, qty to your taste. **If you can not get Dulce de Leche, you can boil a tin of condensed milk for 3 hours, or tip the condensed milk into a small saucepan, stir and cook till caramelised. banana leaf for lining if you have some if not grease baking tray/dish with butter. Soak the rice for few hours.Drain with sieve and shake off excess water. Put rice in a glass or microwave proof bowl. Then add in about 300ml water. Cook rice in microwave for about 8 - 9 minutes on high till water is absorbed. I did not leave the rice to cool. Stir in coconut milk, salt, sugar and as much nutmeg as you like. Beat the eggs in a separate bowl then stir in rice mixture. Preheat oven to 180 deg C. Line a baking tray or dish with banana leaf. To soften the banana leaf gently heat with direct flame. Pour in the rice mixture. I grated more nutmeg on top. Bake for about 15 - 20 minutes till set. While the rice pudding is baking, make the topping. Mix all the ingredient together. Take rice out after 15 - 20 minutes baking. Pour on the topping. 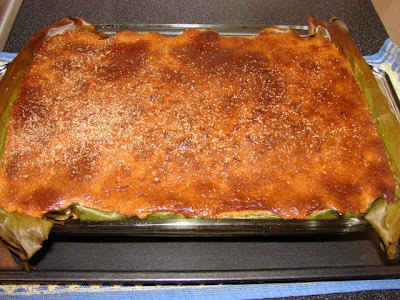 Return rice pudding to oven and bake for another 35 - 40 minutes till the topping is rich golden brown. I love nutmeg so much I grated more on top after baking. Serve hot or cold. When hot the top is really delicious and crunchy. When cold this pudding can be cut into slices. Bake till topping is rich golden brown. It looks sinfully delicious and I would love a taste of it! I will ask my Philippino sister-in-law if she can make it for us someday! It's kiind of similar to Wajik. This recipe I posted is quite soft, wajik is firmer. I am not too sure my recipe is authentic. I think the original biko is steamed glutinous rice with brown sugar and coconut milk. Then boil some more coconut milk in a separate pan till the liquid reduced and finally turned to oil and solid. 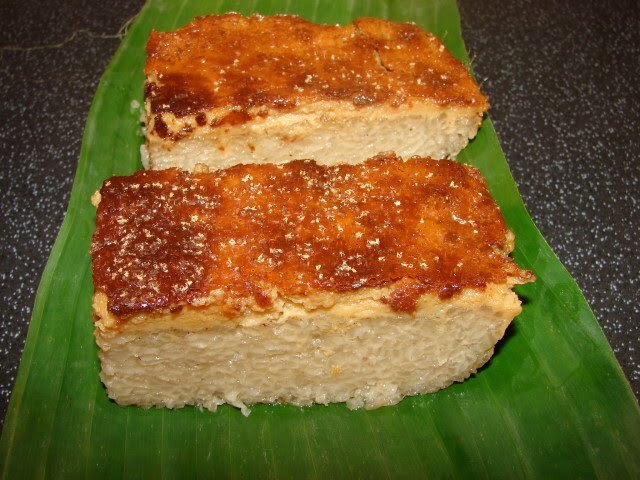 Then this caramelised coconut solid is spread on the cake.